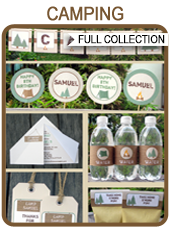 Firstly, download my Camping Printable Collection and then take a look at my video tutorial below. It shows you how to personalise the invitation using Adobe Reader. Remember, my printables only work in Adobe Reader and not any other PDF viewers (such as Preview etc). 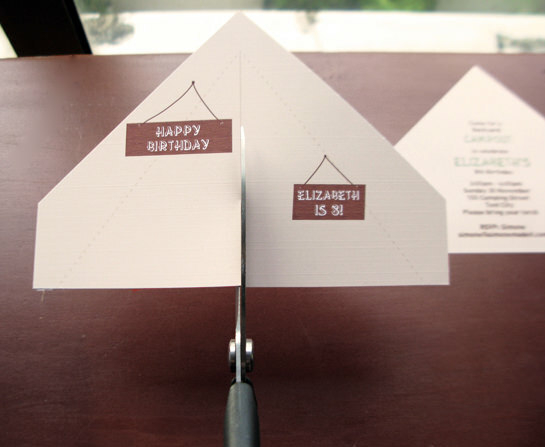 Now you will need to cut out the top and bottom sections of the tent invitation. The cut marks on the page (the short black lines on the edges of the paper) are there to act as a guide – they show you where to line up your paper trimmer/guillotine. Cut around the outlines of both sections. Take the top section of the invitation and using scissors, cut along the middle line, only to the top of the line (not all the way up!). Now, fold along the dashed lines. I recommend scoring along the dashed fold lines first if you can, this will help you create a cleaner fold line (if you don’t have a scoring tool, you can run a very blunt knife along a ruler) – but it’s not essential. There you have created the flaps of the tent. Turn the paper over and glue the outer area (not the flaps!) with a glue stick. Now carefully place the top section on the bottom section so that all the edges line up. And your Camping Tent Invitation is all finished!